Well, I got my super, awesome fab-u-lous package from Jane a few days ago. Life has been so crazy that I'm just getting around to enjoying digging into this great treat! Check it out! 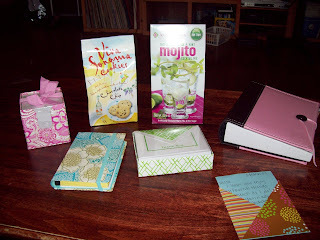 Jane sent me some yummy chocolate chip cookies, a mojito mix, a really pretty coupon organizer, some green & white thank you cards (I love green! ), a really pretty pink notepad cube thing, a beautiful pink & brown photo album, and a wonderful little card! Everything was wrapped so cute too! Thanks so much Jane! I love my package! I sure hope Jane enjoys her package. I sent it, but it wasn't packed well and it had an accident with a leaky bottle. So, back to me it came and I had to start from square one. It didn't get wrapped up pretty the second time around, but I hope she likes it. I'm keeping my fingers crossed! 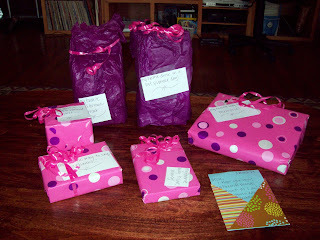 Anyway, thanks to Jane and to Mamarazzi for hosting this fun swap! What a great box..you made out. I really enjoyed doing the swap also. looks like some really good stuff! i am sorry about your leaky package but it sounds like it all worked out ok.